As I read about the "Anti-Gay Day" organizing at McGuffey High School in Claysville, Pennsylvania in Washington County, I was disappointed but not shocked. Claysville is about 30 minutes south of Pittsburgh, where I live. My partner grew up in a similar rural community north of Pittsburgh. As I wrote on my blog, the organization of the tactics suggests adults were involved. But on a very serious note, this is a troubling turn of events. These kids didn't just spontaneously pull a homophobic move. They have a plan. They have coordinated outfits. They live and attend school in a county with no discrimination protections based on sexual orientation, gender identity or gender expression. I bet they have parents who share these hateful little views. When I read that a pastor had met with 20 youth involved in the homophobic plotting, I was convinced that all of these youth were being used for a larger agenda. Mind you, that doesn't absolve them of culpability for their participation. It simply reminds us that this is not an isolated incident or a youthful indiscretion, especially for the LGBTQA youth who attend McGuffey. The Washington County Gay Straight Alliance has been on the ground to build safer learning environments for 10 years. They've been regularly attending McGuffey School Board meetings prior to the Day of Silence. I spoke with adult organizers about the best way for the LGBTQA community to respond and the answer was very simple -- show our support to the LGBTQA youth at McGuffey and throughout the county. Let me make a note here that while I typically use LGBTQ when I blog, the GSA organizers specifically asked me to include "A" because they never require students to come out and always welcome allies. So I am honoring their request. How can we support the LGBTQA youth at McGuffey High School and through Washington County and other rural Pennsylvania towns? Here's what we came up with on the ground in Southwestern Pennsylvania. We invite you to join us. 1. Take a photo -- in a flannel shirt if you like -- with a sign that shows your support for the LGBTQA students at McGuffey. I suggest something like "I support LGBTQ students at McGuffey High School." 3. Make a donation of $10.00 (or whatever amount is good for you) to support the Gay Straight Alliance of Washington County which is working on the front lines at McGuffey High. You can also join the Facebook group to share your photos and learn more about how to support these brave youth. 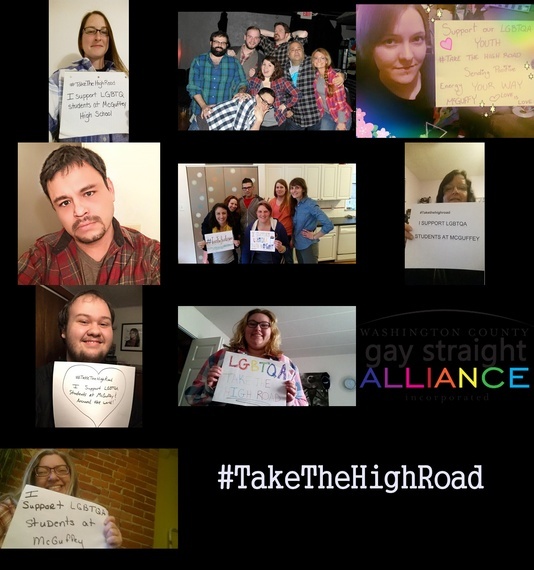 Why ‪#‎TakeTheHighRoad‬? That came from a brainstorming session with Rayden Sorock of the Initiative for Transgender Leadership. The mascot of McGuffey School is the Highlander and the school is known as "McG" -- so Ray suggested a play on the Highlander theme. It also happens to be wise counsel for those tempted to read the comments on any of the media sites covering this story. The high road is the road that supports our young people and their families. It looks a little different for each of us, but what's important is that the students hear us coming. They are not alone. Taking the high road is about being strategic, supportive of our youth and standing firm in our requirement that LGBTQ people are full participants in this nation. If you are fired about the desecration of the flannel shirt meme, take a picture. If you want to reach through the interwebs and give those brave kids a big hug, take a picture. If you can help ensure they all have the resources to attend the Queer Prom in Pittsburgh or other LGBTQA events, take a picture (and make a donation please). There are many ways to interpret the song 'Loch Lomond' -- we suggest this version.